Baron Karza is forced to join forces with the Transformers and Micronauts when Shazraella makes a decision with terrible consequences. As Shazraella descends from the sky, wreathed in the energy of the Time Travelers, Baron Karza remarks in horror on what she's done. Though he believes her actions were unnecessary, with the forces of the Ministry of War dominating the war for the planet, she is resolute in her path... but Oziron Rael is unfazed, seeing theie goal as the same as ever: defeat the villain, save the world. At his direction, the Micronauts charge into battle once more... but with a wave of her hand, Shazraella effortly destroys the first wave of attackers, the Trons. While Oz tries to reason with Shazraella, Karza is picked up by Optimus Prime, his former prisoner, but the tiny despot Enerchanges, melding his form with that of Micronus Prime and becoming a giant towering over the Transformers! As the humongous, centauroid Karza clashes with Optimus and his allies Jazz and Arcee, Acroyear clashes with his opposing number, Commander Raith, while the other Micronauts fight their way through the remainder of the Ministry's army. But Shazraella simply walks towards the giants' battle, blue energy trailing behind her, and things... change. The Transformers now sport industrial, "steampunk" alternate forms, while the fighting Acroyears wear piratical garb over their power armor; and as she continues things change again, and again, the hapless Micronauts shifting from cavemen to vikings to superheroes as they desperately move to try and stop Shazraella from distorting time against them... but as they get near, Shazraella reaches out an arm and Oz is reduced to dust, the golden helmet sent spinning to the floor. Some time in the past, Oz converses with a Time Traveler in a dream-like realm. The cosmic being informs him that, while he will not remember this part of their conversation, at some point in the future time will stand by him and embrace him. Though Oz snarks and refuses to take the situation seriously, the Time Traveler is, for once, direct with him: he will go to another universe, and fight a war on behalf of Earth in a battle; not between Microspace and humanity, but between Time Travelers. Oz jokingly asks if he gets a choice in the matter, since he "has plans with Microtron on Friday"; but the being tells him that, while the choice is his to make, if he makes the right one more than one universe will be indebted to him. The Karza-Micronus fusion fends off the Transformers, tiny in comparison to his gargantuan size, as he defends his actions by claiming that they had been already written in prophecy. He is distracted, however, upon seeing Shazraella, and recognises the blue energy that glows around her hands and is left in her wake as that of the Entropy Cloud itself! Optimus Prime tries to take advantage of his distraction to strike a blow, but Baron Karza has no time for the battle, insisting that the Transformers set aside their quarrel with him and stop his wife, lest their universe be destroyed as well as his. Shocked at the would-be conqueror's willingness to give up on his invasion for the preservation of their universe, Optimus agrees to a truce. The Baron begs his wife to stop what she's doing, but she claims that their future belongs within the Entropy Cloud, not running from it; and when Karza declares that he cannot let her continue, she harnesses the power of the Entropy Storm to tear his body and Micronus Prime's apart from each other, banishing the ancient Transformer through time. Karza is saved from falling to his death by Larissa, his daughter, but the empowered Shazraella still stands unfazed by the battle, ready to take on any comers. Suddenly, however, reinforcements for the Micronauts and their allies arrive: Oziron Rael has returned, now embraced by time and ascended to the form of a Time Traveler! Reclaiming and merging with the golden mask that has aided him and the Micronauts on their adventures, Oz and his fellow Time Travelers lay hands on Shazraella, tearing the power and form of their maddened brother from her body and imprisoning him in a time chamber forevermore, with Baron Karza and Shazraella trapped by the cosmic beings' power. The day saved, the ascendant Oz promises a unity between Microspace and Earth: the Time Travelers will place permanent spacebridges in place between the two universes, and begin to repair the damage that the Entropy Cloud has caused, starting with the harm that Shazraella brought to Earth. Optimus Prime offers to help prepare the refugees of Microspace to adapt to their new home, with Oz promising that when the damage from the Cloud is repaired, they will be free to return home or remain on Earth as ambassadors; and though the Micronauts are left without their captain, Oz leaves them a message for Acroyear, currently finishing up his duel with Raith: they will be reunited soon. "Do not think, daughter, that your heritage will exempt you." "Time is all things. And now it is my time!" The mad Time Traveler was established to be the root of the Entropy Storm back in Wrath of Karza #3. We don't blame you if you forgot, since those Karza-in-the-Entropy-Storm interludes seemed a bit samey at the time. Oz's conversation with the Time Traveler took place back in Micronauts #6, though we didn't see this bit of it at the time. The second set of time-warped forms taken on by the Transformers are all Cybertronian bodies used by the characters earlier in IDW history: Optimus Prime sports his original pre-Earth design, which debuted in Stormbringer, Jazz has his body from his Spotlight's flashback story, and Arcee wears the War for Cybertron design she spent Robots in Disguise "season 1" in. Biotron enerchanges into his tank form, originally seen in Micronauts #2. 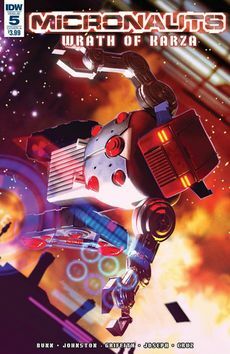 The first form that Optimus Prime takes on when time shifts is that of the "Hearts of Steel" Optimus Prime from Infestation 2: The Transformers, complete with train kibble, most recently seen on the brainwashed Eukarian Domitius Major in Revolutionaries #6. Jazz and Arcee get matching designs, but unlike Optimus, they don't show evidence of new alternate modes; they're just "steampunk" versions of their current IDW designs. The last set of forms the Micronauts take on are heavily based on their original toys ("Pharoid", "Space Glider", "Galactic Defender", "Biotron", and "Microtron"), albeit with a couple of design concessions to their IDW designs, like Oz's beard. The Micronauts' "caveman" forms, with their "bamboo technology" designs, are clearly inspired by The Flintstones. Jazz describes himself as "going with the flow, like Thelonious Monk. Just for the sake of completion: the other three sets of forms the Micronauts take on are (pop culture style) Vikings (with Oz in a horned helmet), "Silver Age"-style superheroes (featuring a Biotron that sports some rather shapely abs), and a "gender flipped" version of the team with a female Oz and male Phen and Larissa... with Biotron and Microtron's designs unchanged, because they're non-human-looking robots. Originally solicited for release in August, this issue arrives a month late in September, continuing IDW's series of ongoing delays. Cover A: Microtron takes a tumble, by Alex Ronald. Cover B: Oz, Larissa and Acroyear, by Bart Sears; part of IDW's "Bart Sears cover month". Retailer incentive cover: Our heroes and villains with Acroyear at the forefront, by Ray Dillon. This page was last edited on 5 April 2018, at 12:59.